The Shoal is an amusement arcade in Splatoon 2. It is found to the right of Inkopolis Square. The Shoal is a local multiplayer mode category selection screen of Splatoon 2 where players can choose a game mode to play locally, each player requiring separate consoles and copies of the game in order to play. 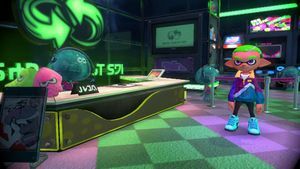 The player can enter The Shoal from Inkopolis Square or tap on "The Shoal" on the map. There are two game modes available: Private Battle and Salmon Run. The player can either choose to host these modes or search and join other peoples' lobbies. These modes differ slightly from their online counterparts, as Private Battles at The Shoal do not allow for spectators in local wireless play and there are some extra options for the host, while Salmon Run has different selectable weapons and the host can set the difficulty. A list of available weapons at the Shoal and the day they were made available is listed below. A manual for Salmon Run is also available to read by pressing while on the main screen at The Shoal, where the first page is a short summary of how to play the mode, while pressing shows the Salmonid Field Guide. A hidden mode of LAN battle is available by holding and and pressing and holding in the stick. It is possible to obtain Crusty Sean tickets by playing in The Shoal on eight different days. In a Local or LAN room, in Salmon Run or Private Battles, the Salmonids and squids swimming in the background of menus will be replaced by pixelated versions. According to Marina, The Shoal is not very popular any more. Weapon selection for Salmon Run in The Shoal. ↑ Dutch localisation of the Retro vs. Modern announcement dialogue. Pearl: "Ik kan toch niet zomaar Squid Jump vergeten? Die game was mijn jeugd! Daarvoor ga ik nog regelmatig naar de speelhal op het Inkopolisplein." This page was last edited on 10 April 2019, at 15:21.